Sunlight and water are two obvious requirements essential for healthy growth of plants, but did you know that zinc is also a vital ingredient? Zinc is a critical nutrient in hundreds of enzyme systems which are necessary for normal plant function. Zinc is also critical for human health – in fact, zinc is involved in more body functions than any other mineral. Plants get zinc from the soil via their root systems. This uptake of nutrients is enhanced in many plants by mycorrhizal fungi which colonise the roots, creating a vast connection between the plant roots and the soil around them. Mycorrhizal fungi effectively increase the surface area of the roots, collecting nutrients from the soil beyond the reach of plant roots alone, and transfer these nutrients back to the plant. 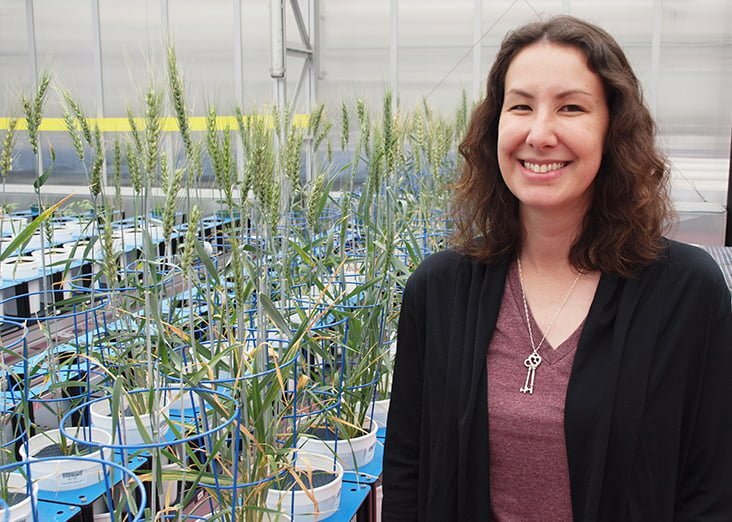 Scientist, Dr Stephanie Watts-Williams, wants to find out how such mycorrhizal fungi can improve the zinc nutrition of plants, and subsequently impact on human health – particularly in countries where zinc malnutrition is a serious issue. “I am working with Medicago truncatula, which is an important pasture legume in Australia and a good study species as it grows quickly and is easy to work with,” Stephanie said. She is currently utilising the Plant Accelerator here at Waite to conduct experiments looking at the effect of different zinc concentrations in soil on plant growth and zinc levels. Illustration of a root tuber colonized by an arbuscular mycorrhizal fungus. Stephanie’s research has potential implications for food production and human health. “The mycorrhizal symbiosis will be more efficient and effective at taking up nutrients into the plant, so farmers could apply less fertiliser while achieving the same nutrient concentrations and yield in the crops,” she said. “Looking beyond our own backyard, increasing the concentration of zinc and other nutrients in the edible parts of plants (known as biofortification) could have a real positive impact on the lives of people in developing countries”. Stephanie started at the Waite in 2016 where she is a Ramsay Fellow with the School of Agriculture Food and Wine and the ARC Centre of Excellence in Plant Energy Biology. Originally from Melbourne where she completed her undergraduate, Honours and PhD studies, Stephanie spent 18 months at the Boyce Thompson Institute for Plant Research at Cornell University, New York before moving to Adelaide. “I’m enjoying the community environment at Waite. I was worried that coming from such a large University such as Cornell, that I would be frustrated with the isolation of working in Adelaide, but this hasn’t been the case and Waite campus has an enormous wealth of resources and researchers,” Stephanie says. The Ramsay Fellowship was established by the University of Adelaide in 2008 with a bequest by the Ramsay family, founders of Kiwi Shoe Polish Company. The four-year Ramsay Fellowships are offered annually to help advance scientific research and to encourage young Australian scientists working overseas to return home without disadvantaging their careers. Outside of the lab, Stephanie enjoys playing Pokemon Go and Playstation, reading comic books and building superhero themed Lego sets!